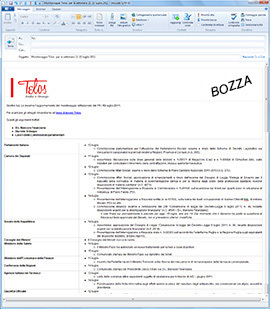 Telos follows the activity of the Institutions at the regional, national and EU level on a day-by-day basis. The regular update on both regulatory change and the dialogue among different levels of Government, productive categories and other stakeholders is a key tool, allowing to detect those decision-making and negotiating processes that are able to generate a concrete impact on the regulatory framework. 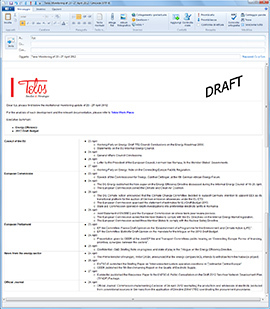 Telos sends to its clients, by e-mail, the Agenda of the institutional activities concerning an agreed selection of topics that are scheduled for the period considered and an Outline of those already performed, through a system based on a web platform. By clicking on each of the 2 links above, you will be re-directed to an e-mail, containing the headlines of the relevant developments. You will find an in-depth analysis of each development and the relevant documentation by opening the e-mail, reaching to the Work Place through the link and clicking on the “Accedi” (login) button. Please remember to log out when leaving the Work Place.